Actor, director and producer of American cinema, born 18 August 1937 in Santa Monica (California), whose full name is Charles Robert Redford Jr.
His relationship with art starts at the University of Van Nuys, Colorado, where he/she studied painting. There it shows great conditions for sport, at the same time standing as a great baseball player, thinking at any time to devote to this activity in a professional way. However he/she soon discarded that possibility. In 1957, he/she decides to leave United States and begins a tour of Europe attracting him the possibility of knowing other environments, new people and have direct contact with some cultures and different behaviors. On that trip he/she feels trapped by cities of art like Florence or Paris tradition. To survive carries out more unexpected works, what then has recognized have served you both to their personal training and for their professional activity. Back to United States, with 23 years, he/she decided to study dramatic art, enrolling in the American Academy of Dramatic Arts. In a short time is working on circuits of Broadway, in which he/she collaborated as production designer on occasion, taking advantage of his knowledge of painting. Initially known for his physique: although it is not very high, possesses some attractive features blonde it is, clear eyes and a suggestive diction - which will take you to get the public to repair it promptly. With less than 30 years film called him and begins to act to the big screen. Is for little-known example that was proven to work in West Side Story (1961); Finally it was not accepted. Almost below occurs her debut film with her performance in who killed for pleasure (1961), with Dennis Sanders. Yet as secondary, it will highlight in the rebel (1965), an important film of Robert Mulligan where plays the role of a homosexual. He began to be considered as a young actor with projection from his performance in the Chase (1966), Arthur Penn. It is an intense drama, with important racial connotations, that achieves a good welcome and where work other young actors, which over time will get reach the top, as it is the case of Jane Fonda, which years later would share cast in other productions with Redford. In the same year, it achieved a role of male protagonist in condemned property (1966), Sidney Pollack, a director that would roll some of his most important films in the following years. His entry into the space of the big stars get it by a comedy: barefoot Park (1967), Gene Saks, a theatrical adaptation of Neil Simon blockbuster. It is a comedy about the life in common that starts a young marriage. His female opponent was Jane Fonda, and the interpretation of Redford is worth to him to start climbing in the cinematographic field, which already would not abandon.It could have been the protagonist of the graduate, the movie that made famous to Dustin Hoffman. Nonetheless, at the end of the sixties comes confirmation that all the effort had been worthwhile. Two men and a destination (1969), George Roy Hill - which rolled together to Paul Newman, who demanded to be its companion of cast - would become a milestone in the career of its two main actors: sympathy and irony of the two men has been as a model of interpretation at the time. It was a comedy with dramatic purple set in the old West; the narrative around two roommates and friends of adventures as bandits, the love of an attractive girl (Katherine Ross played) and the musical band, which had a song that has become a classic ("drops of rain"), did film a memorable tape. The success would lead to some years later, rodase is not a continuation, but a film of similar structure, as it was the coup (1973), Roy Hill, also with Newman, and that Redford was nominated for the Oscar. The atmosphere was, on this occasion, in the world of gangsters from the years veinte-treinta. Without reproducing all what it meant two men and a target, the new tape had a good business development. Another new and important performance of Redford referred when wheel a adaptation of "The Great Gatsby", by Scott Fitzgerald, one of the most emblematic American novels. Directed in 1974 by Jack Clayton, it had everything you need to be a big production, but the cinematic outcome, as it tends to be quite frequent in versions of well-known novels, was seen at the height of the original and expected. But all admitted that the composition of the actor Robert Redford took place was adequate to the psychology of the character. However, in recent years intervenes in out of Africa (1985), Sydney Pollack, one of the most important works from the point of view economic and also film of the Decade. With Meryl Streep as a companion of cast, the character of Redford - who was about to roll it with Jeremy Irons, who became fascinated by the role, allows you to get one of their best performances. During the 1980s his pace of work as an actor lapses, as he/she started to work at the same time as a director. A career in which, even with fewer actions than as an actor, has been discussed successful. In this sense, Redford begins with people power (1980), a melodrama about a wealthy family, one of whose children have psychological problems as a result of the death of his brother. The film was controversial despite his recognition. For important sectors of criticism, it is a very usual melodrama, without appreciable values; However, the public had a more positive attitude toward the tape, which reaped good economic results. Get four Oscar from the Academy of Hollywood, including best film and best director. His second film as director is a place called miracle (1988), based on a novel by John Nichols. Situated action on the border of Mexico, it is a parable about the social situation and the relations between the more affluent and the poor of the place. Years later, with the river of life (1992), approaching the life of an American family over twenty-five years. He/She was inspired by a novel by Norman MacLean. The skills of director of Redford, shone high in this work, qualities that fair Quiz Show: the dilemma (1994), a history around the traps to attract public committed in television competitions. The protagonist was Ralph Fiennes and his performance showed the ability of Redford to direct actors, being one of the elements that contributed to the success of the film, whose approach seemed rather difficult. Years later he/she would intervene in man whispering to horses (1998) as actor and director, adaptation of a well-known best seller, whose plot revolves around a trainer of horses that recovered them when they have had not only physical problems, at the time that helps a girl who had a major accident with the animal. Robert Redford has tried whenever its cinematographic activity should be as wide as possible and that it be not limited to bright or spectacular of the same aspects. In this sense, has been the promoter and financier of the "Sundance Film Institute", institution which has among its activities the organize a film festival, unlike the more usual and famous. Its main mission is to discover new values, to make them known and try to facilitate his commercial career. Try to make an arthouse - research to some extent - and to open new horizons for professionals and spectators. 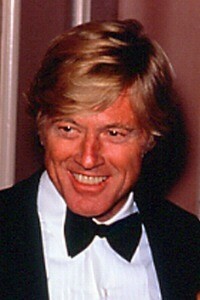 Robert Redford has proven to be a shining star. Endowed with a great demeanour, he/she has taken advantage of all their biographical experiences that have served, in his words, to be self reliant and solve things by yourself without expecting anything from others. In many publications noted him as the actor more attractive of the twentieth century, ahead of men such as Marlon Brando and Paul Newman. The film for it, without neglecting it commercially, should be first and foremost a culture channel, a means of communication. A person who is dedicated to the cinema must, according to Redford, set his eyes on the needy, requiring help from the type that is and films to serve so that we become aware that life is harder and more romatica, at the same time, what to some may seem. In 2002, the Academy of Hollywood the honorary Oscar presented in recognition throughout his career. In addition to the film, Redford has also directed its efforts to some charitable causes and social interest, especially to the defense of ecology; proof of this is the prize he/she received in March 2004 by American national natural resources Defense Council, based in New York. 1961: who killed for pleasure. 1965: Desperate but less; The rebel. 1966: The Chase; Condemned property. 1967: Barefoot in the Park. 1969: The Valley of the fugitive; Two men and a destination; The decline in death. 1970: The price of failure. 1972: The candidate; A red-hot diamond; The adventures of Jeremiah Johnson. 1973: The coup; As we were. 1974: The Great Gatsby. 1975: The three days of the condor; The Eagles Carnival. 1976: All the President's men. 1977: A distant bridge. 1979: The electric Horseman. 1980: Brubaker.1984: best. 1985: out of Africa. 1986: Dangerously together. 1990: Havana.1992: the prying eyes. 1993: An indecent proposal. 1996: Intimate and personal. 1997: Anthem.1998: tangling shadows; The man who whispered to the horses. 2001: The last castle; Spy Game. "1970: The Making of ' Butch Cassidy and the Sundance Kid". 1974: Broken Treaty at Battle Mountain. 1989: Yosemite: The Fate of Heave (Narrator); Changing Steps (Narrator); To Protect Mother Earth (storyteller). 1991: Our Biosphere: The Earth in Our Hand. 1992: Incident at Oglala (storyteller). 1996: Wild Bill: Hollywood Maverick. 1980: Ordinary people (only address). 1988: A place called Milagro. 1992: The river of life. 1994: Quiz Show: the dilemma. 1998: Man whispering to the horses. 2000: The legend of Bagger Vance. 1981: The Solar Film. 1988: Promised land. 1989: Some girls. 1991: Tempest in the plain. 1992: Incident at Oglala. 1996: It is unique. 1998: Slums of Beverly Hills; Civil action; Don't look back. 1957: Maverick.1959: Hallmark Hall of Fame; The Deputy; Playhouse 90. 1960: Tate; Perry Mason; Naked City. 1961: The Americans; Route 66; Whispering Smith; Bus Stop; Alfred Hitchcock Presents. 1962: The Twilight Zone; Alcoa Premiere. 1963: The untouchables; Breaking Point; The Virginian; The defenders. 1996: Grand Avenue (prod. Executive). 1998: Independent completo Day.